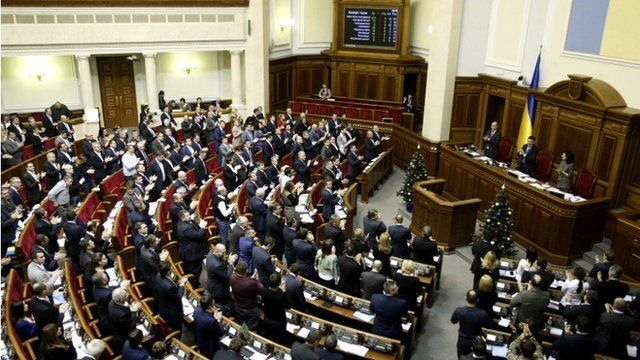 Cheers as Ukraine drops neutrality Jump to media player Ukraine's parliament votes to drop the country's non-aligned status and work towards Nato membership, a move quickly criticised by Russia. Russia demands guarantees from Nato Jump to media player Vladimir Putin's chief spokesperson says the West's response over the Ukraine crisis makes them "feel fear". Pro-Ukraine protest in Simferopol Jump to media player The BBC's James Reynolds takes a look at what it is like for pro-Ukraine protesters in Simferopol. Ukraine ceasefire 'is an illusion' Jump to media player Fergal Keane reports from Donetsk in eastern Ukraine where bombing continues despite a peace deal signed in September. Russia sanctions hit UK businesses Jump to media player Caroline Bayley reports on how US and EU sanctions imposed on Russia have had an adverse impact on some British businesses. Poroshenko in reform pledge Jump to media player The Ukrainian President Petro Poroshenko has promised a programme of radical reform during an address at the opening session of the country's new parliament. Sanctions hitting Russian oil firms Jump to media player Opec's meeting in Vienna is being closely watched in Russia, which depends heavily on oil exports but is being hit by Western sanctions over Ukraine. UK joins Poland in Nato drill Jump to media player UK troops take part in the largest British armoured exercise in Europe since 2008. Ukraine's parliament has voted to drop the country's non-aligned status and work towards Nato membership. Russian Foreign Minister Sergei Lavrov called the move "counterproductive" and said it would boost tensions. Ukrainian President Petro Poroshenko pledged to seek Nato membership over Russian support for rebels in the east.